I’m an active musician in a variety of bands and I also do solo performances. There’s a brief review of my musical activities below. 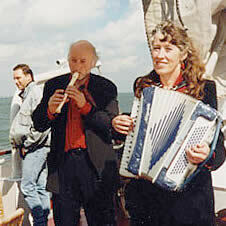 More information (at present only in Dutch) is obtainable from www.muzemakers.com, a joint venture in music and poetry with my partner, Anneke Rot. Recorder: namely sopranino, soprano, tenor and bass recorders. Bass guitar: acoustic EKO bass guitar, electric Hofner (“Beatle bass”), electric Ibanez Musician bass guitar. Additional instruments – with the Rivelli band: objects lost and found, chains and other types of door furniture, African thumb piano (Mbira, Kalimba). Background music, including world music such as traditional Dutch, Irish, Italian, Klezmer, French musettes; also Dutch sing-alongs; live music adapted for burials and cremations. 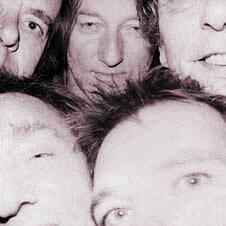 Background or swing, as the circumstances dictate: country and western, Irish, various types of world music. 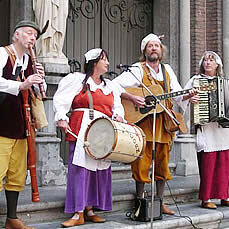 Historic Dutch folk music from 1400- 1900. Concerts and background music for occasions such as mediaeval dinners, historical events and city charter celebrations. In historic settings we perform in costumes copied from paintings by Dutch masters in the Golden Age. “Impro-explo-group” comprising figurative artists and musicians who perform for avant-garde audiences and presentations of modern art. A refreshing experience for those who think they’ve seen it all before. 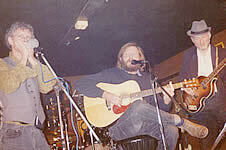 Blues trio: vocals, guitar, bass, harmonica. 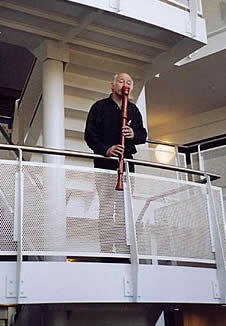 Improvisations on the flute for meditation sessions, openings of exhibitions and suchlike.